Digital advertising is gradually growing in the country. According to the FICCI-KPMG report, the Indian Media & Entertainment (M&E) industry is expected to register a CAGR of 14.2 percent to touch Rs 1,785.8 billion by 2018 wherein digital advertising is expected to have the highest CAGR of 27.7 percent while all other sub-sectors are expected to grow at a CAGR in the range of 9-18 percent. 1. The Indian M&E industry registered a growth of 11.8 per cent in 2013 over 2012 and touched Rs. 918 billion. The overall growth rate remained muted, with a slow GDP growth and a weak rupee. 2. Gaming and digital advertising were the two prominent industry sub-sectors which recorded a strong growth in 2013 compared to the previous year, albeit on a smaller base. 3. The number of TV households in India increased to 161 million in 2013, implying a TV penetration of 60 percent. The number of Cable & Satellite (C&S) subscribers increased by 9 million in 2013, to reach 139 million. The size of the Television industry in India was estimated at Rs. 417 billion in 2013, and is expected to grow at a CAGR of 16 per cent over 2013-18 to reach Rs. 885 billion in 2018. 4. 2013 saw the Print industry grow by 8.5 percent from Rs. 224 billion in 2012 to Rs. 243 billion. The long-term growth in the sector looks promising with possible future demand in the regional market. The print industry continued to derive most (94.4 per cent) of its revenues from the newspaper category. 5. The growth in the magazine industry is expected to decline over the next 5 years and may constitute 3.6 per cent of the total print industry. 6. 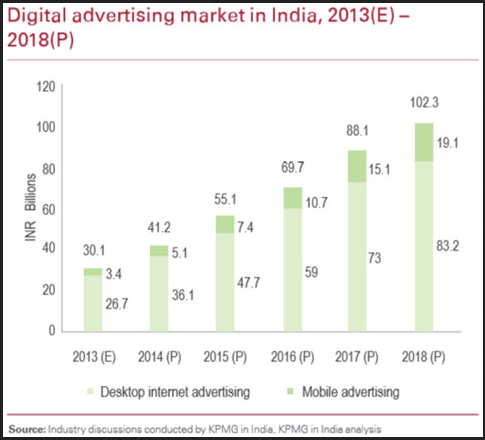 Digital ad spend in India grew by approximately 38.7 percent to touch Rs. 30.1 billion in 2013. 7. Indian mobile advertising is expected to grow at 50 percent and reach Rs. 5.1 billion by end- 2014. 8. 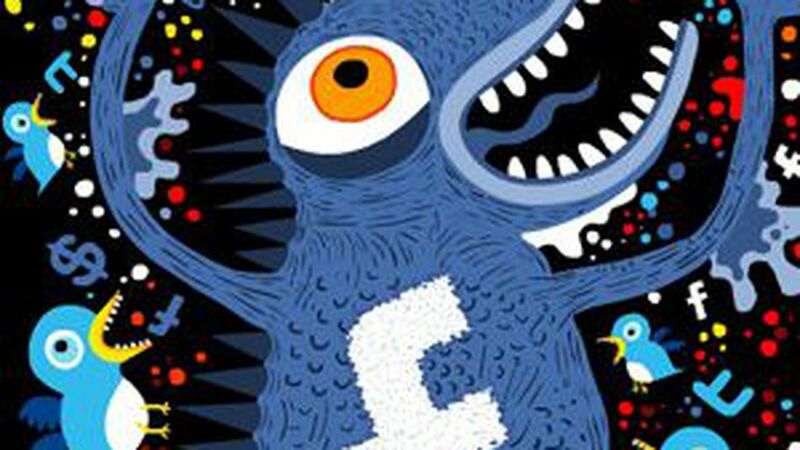 The ad spend in digital media is set to grow at 37 percent to reach Rs. 41.2 billion in 2014. 9. Overall, the advertising market is expected to reach Rs 694 billion in 2018 at a compounded annual growth rate (CAGR) of 13.9 percent. Digital media is expected to continue its growth with projected growth rate of 36.9 percent in 2014. TV, Print, Radio and OOH are also expected to perform better in 2014 with projected growth rate of 11.9 per cent, 10.1 per cent, 13.7 per cent and 10 per cent respectively.